I’m just going to come out and say it… This is probably my favorite outfit, ever. I saw Gabby wearing this dress at the Veuve Clicquot Polo Classic a few weeks ago and I couldn’t believe it when she told me where it was from. (I may or may not have purchased it from my phone right then and there! ha) And even better for you… It’s currently on sale for under $100! All sizes are available, too. Run, people! The fabric also comes in a cute button-front skirt and I’m seriously considering buying it, too, with the 40% off promo this weekend! What are your thoughts?! The halter neckline is so flattering, too. 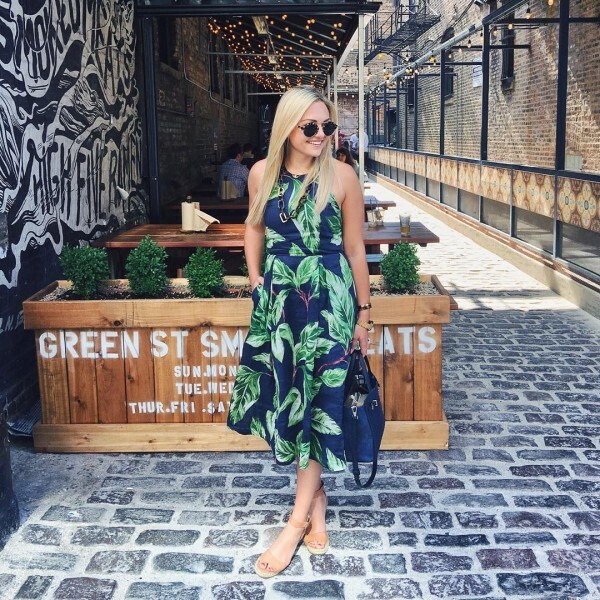 It’s perfect for summer, especially when going from your desk out to drinks and dinner. Toss a denim jacket or a cute little white blazer over the top at the office and then shed it once you’re off work! The print pairs perfectly with tortoise anything. I wore my new tortoise sunglasses and J.Crew tortoise cuff with this outfit, and then wore my tortoise link necklace when I wore this dress a different day. I actually didn’t think the tortoise necklace was going to work with this halter neckline, but it surprisingly did! See my Instagram photo below! Speaking of tortoise jewelry… J.Crew is killing it right now. I am absolutely obsessed with this necklace and this bracelet. Tortoise and glitter… Are you freaking kidding me? Sounds crazy, but it works and it works well! Also, this monogram tortoise bracelet?! So good! 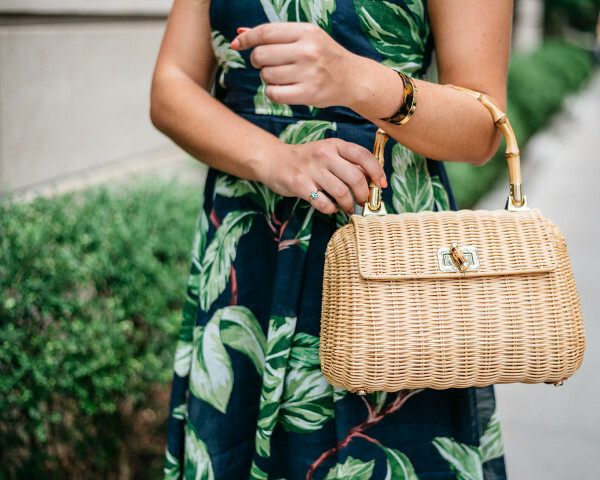 I love the look of a rattan or wicker bag with this dress, too! Especially love the rattan with that print! Such a cute outfit, Jess! Oh, my! That dress is adorable. I love it. It is up there with that gorgeous pouffy flared skirt of yours. I don’t think that I could ever pull off this kind of outfit or print, but you look absolutely gorgeous in this combo! 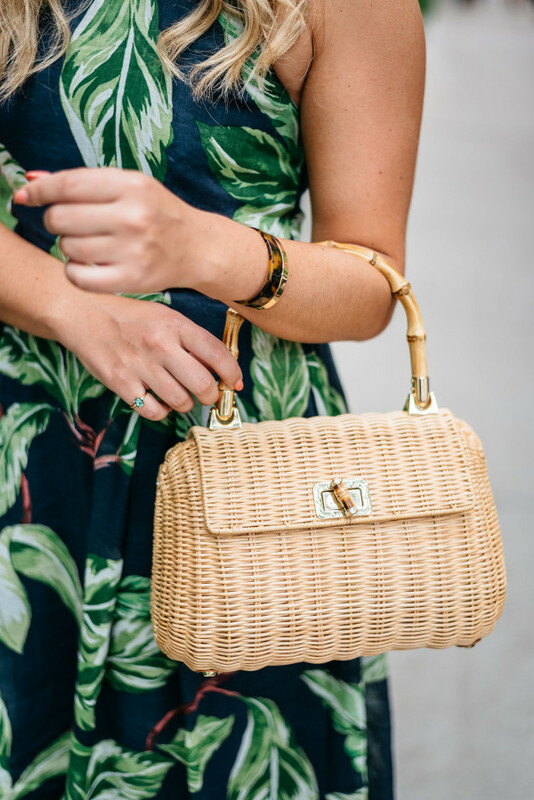 I’m obsessed with that wicker handbag! Love this! I have been eyeing this dress for a while now and may just have to grab it while it’s one sale! That’s such a gorgeus dress! You accessorized it perfectly! Love your dress and pairing this up with your favorite high heel sandals of the summer. You go girl. This dress is so fun! You look great! Loving this look on you! The textured accessories are the perfect addition! Happy Thursday! Oh my gosh YES! What an amazing dress! I love leaf print everything. You look great! You are officially the cutest! Love everything about this outfit!